MISSOULA – The Chiefs and the Pirates competed at the Rocky Mountain Classic Friday and Saturday facing teams from Lewiston to Coeur d’Alene, Idaho. Out of the 34 teams with qualifying team scores, Ronan fared the best, placing 25th with a team score of 47.5. Polson placed 27th with a score of 44. Chiefs Cole Snyder and Hunter Peterson were the only two wrestlers to place individually with Snyder taking fourth after a consolation round loss and Hunter Peterson found a sixth-place spot after falling in a bout for fifth. Polson did not have any wrestlers reach semifinal rounds. The Chiefs slammed all over the Bulldogs in Mission, ruling the mats with of score of 52 to Mission’s 21. Chiefs Seth Cheff (120), Happy Cheff (138), Jared Neiss (145), Jesse Herrera (160) and Luiz Gonzalez (205) all won with pins with Seth Cheff posting an impressive 0:18 take down. Trent Dennison (152), Gus Bosley (170), Steven Bravo (182) and Ethan Goss-Dickie (285) had pin wins for Mission-Charlo. 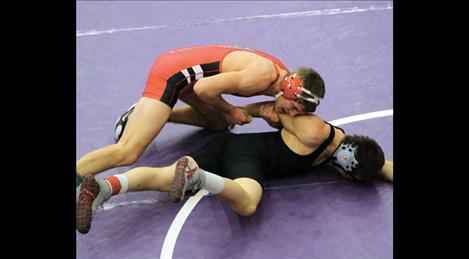 The Pirates had a tough day facing Wildcat grapplers at home, falling 27-41 to Columbia Falls. Pirates Cameron Brown (113), Parker Adler (120), Colton Cote (152), Tele Seemann (170) and Mike Corrigan (205) all won their matches with Brown, Cote, Seemann and Corrigan winning with pins. Arlee and Mission-Charlo also participated in the Choteau Invitational last weekend but no results were reported. Next up for the Valley’s grapplers will be a road trip for Arlee as the Warriors head to Deer Lodge Thursday and then on to Eureka Friday. The Bulldogs will head to Bigfork Thursday and then will return home Saturday to host the Mission Mountain Classic. Polson will be in Columbia Falls Friday and Ronan will travel to Bigfork Thursday and then will join the Bulldogs in Eureka Saturday.